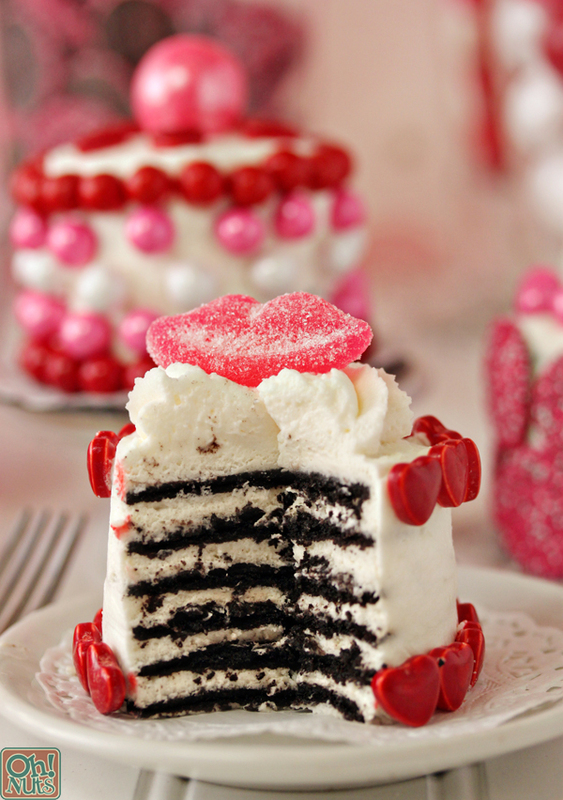 Valentine’s Day is almost here, and I have the sweetest little cakes to help you celebrate! 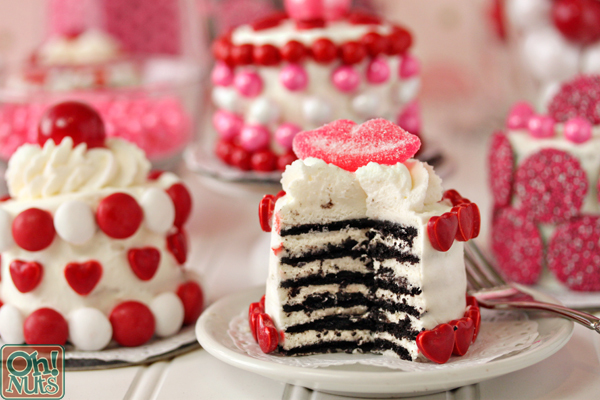 These single-serving Valentine’s Day mini cakes are gorgeous, festive, and most importantly, easy! They’re made using chocolate wafers and whipped cream, which means that you can whip up a batch of them in just a few minutes. The cakes would be good on their own, but it’s the outer coating of red, white, and pink Valentine’s Day candies that really makes them special. The decorations make the cakes so cheerful and fun! I used an assortment of chocolate and gummy candies on the cakes (listed below) but feel free to mix it up and use your favorites! However you decorate them, I know that these beautiful cakes will be a hit with your valentine this year. 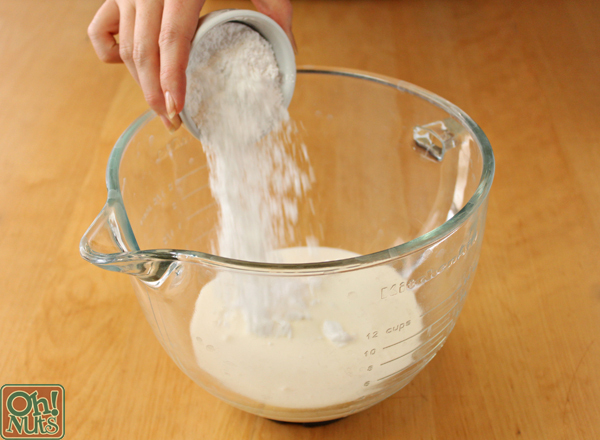 Combine the cream and powdered sugar in the bowl of a stand mixer fitted with a whisk attachment. Whip the cream on medium-high speed until firm peaks form. 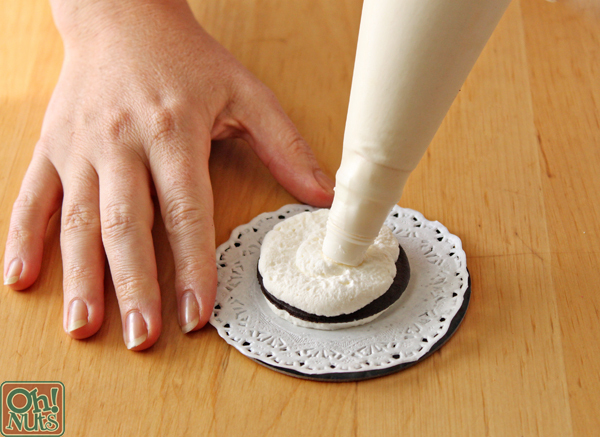 You can use a knife to spread the whipped cream between each layer of cookie, but if you have a piping bag, I recommend putting the cream in a piping bag fitted with a round tip–it’s faster and neater. 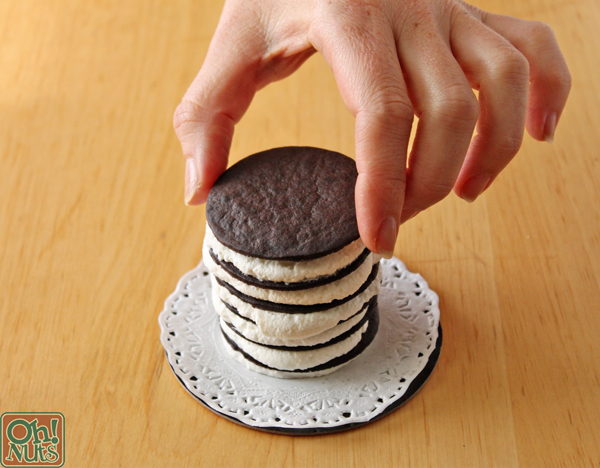 Either way, spread a thin layer of cream on the bottom of a cookie, and place the cookie onto a plate, cardboard round, or other serving surface. After the cakes are assembled the cookies will soften into a cakey texture, so it’s difficult to transfer them later. I put mine on doily-covered cardboard rounds, so they were easy to serve individually. Pipe or spread a thin, even layer of whipped cream on top of the cookie. Pipe or spread more whipped cream along the top and outside of the cake. 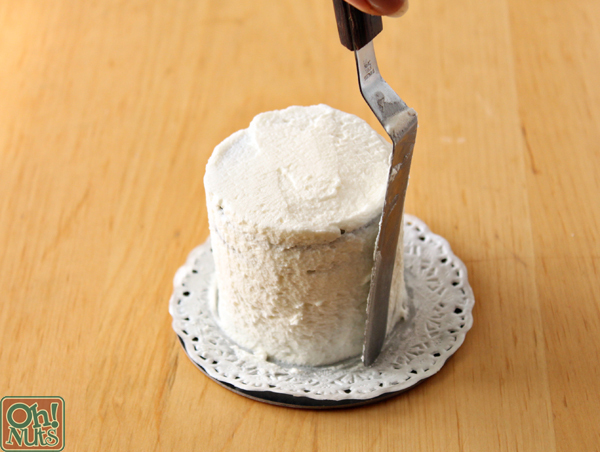 Use an offset spatula or a knife to spread it into a smooth layer. 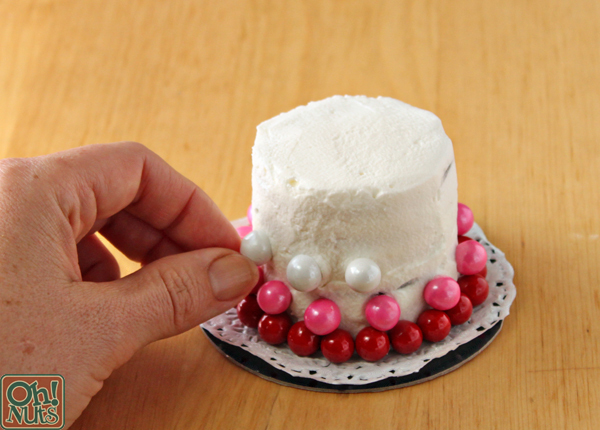 The cake might shift around while you’re working on it, since whipped cream is delicate, so be gentle! Don’t worry about having a perfect finish, because you can always cover up any trouble spots with candy later on. After all of the cakes are assembled, refrigerate the cakes for at least 3 hours, to give the cookies time to soften. The cakes can be made several days in advance and kept, refrigerated, until you’re ready to decorate them. Now for the fun part! 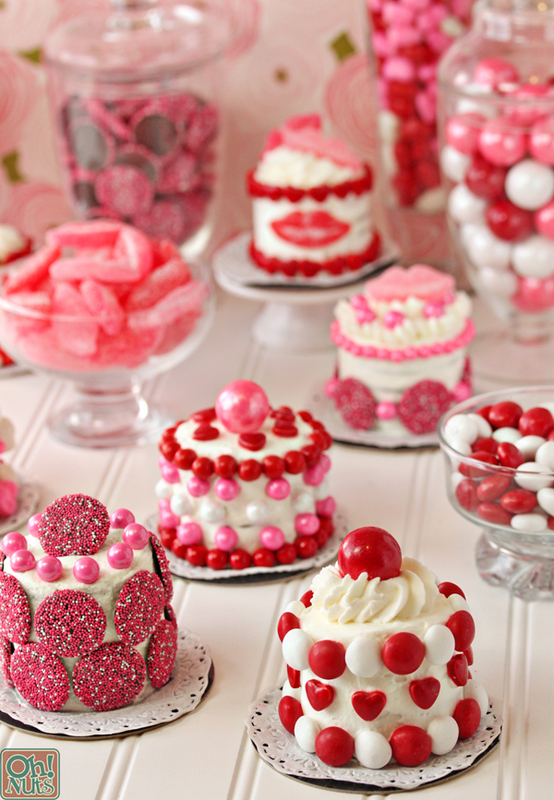 Decorate the cakes with an assortment of Valentine’s Day candy, and additional whipped cream, if desired. Depending on the candy you choose, the coloring might start to seep into the whipped cream as it sits, so that’s why it’s best to decorate these shortly before you plan on serving them. How adorable are these cakes?! They make a sweet ending to a romantic Valentine’s Day dinner, and they also work as part of a candy buffet at a Valentine’s Day party, as shown above. Customize them to your heart’s content, and enjoy them with your loved ones! As always, an easily printable recipe and pin-able image are below. Enjoy! 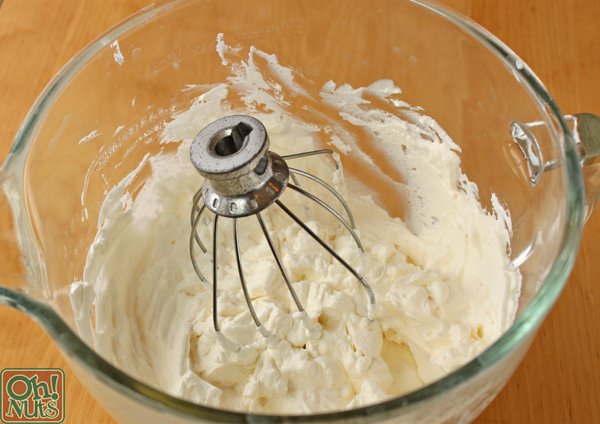 Combine the cream and powdered sugar in the bowl of a stand mixer fitted with a whisk attachment. Whip the cream on medium-high speed until it forms firm peaks. You can use a knife to spread the whipped cream between each layer of cookie, but I prefer to put the cream in a piping bag fitted with a round tip–it’s faster and neater. 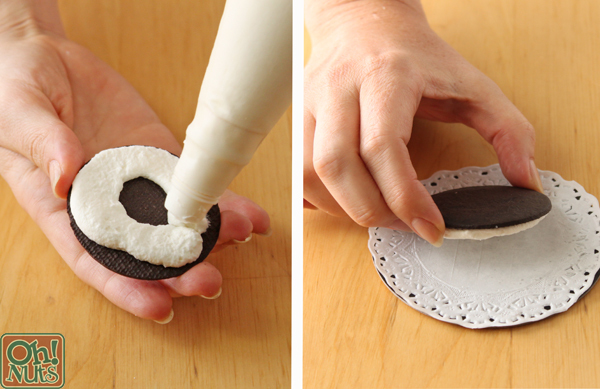 Either way, spread a thin layer of cream on the bottom of a cookie, and place the cookie onto a plate, cardboard round, or other serving surface. 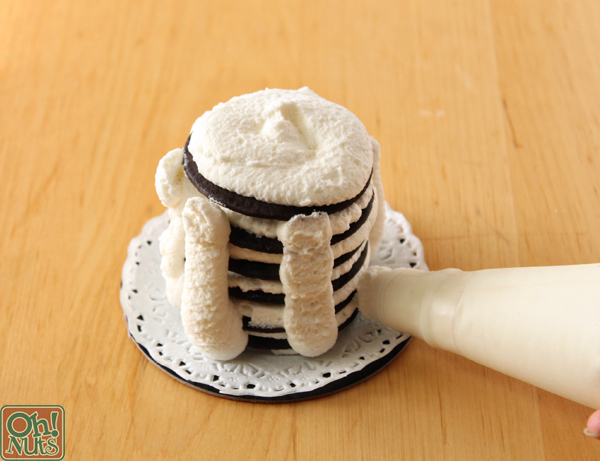 Pipe or spread a layer of whipped cream on top of the cookie, then add a second cookie on top of the first. Continue to add layers of cream and cookies until you have stacked up 6 cookies. 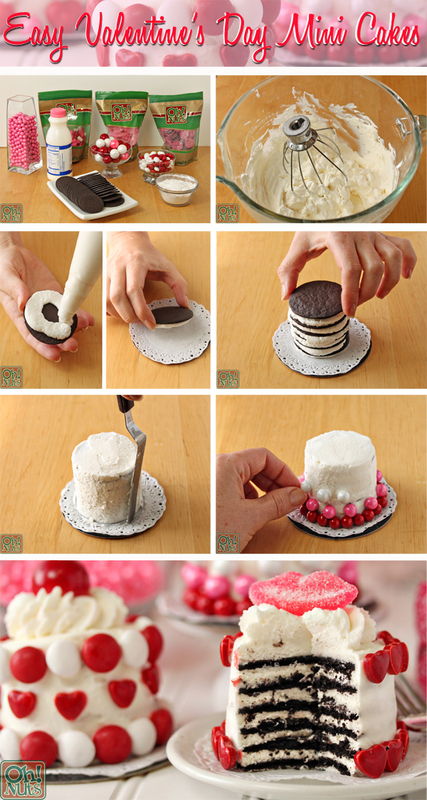 Spread more whipped cream along the outside of the cakes, and smooth it into an even layer. 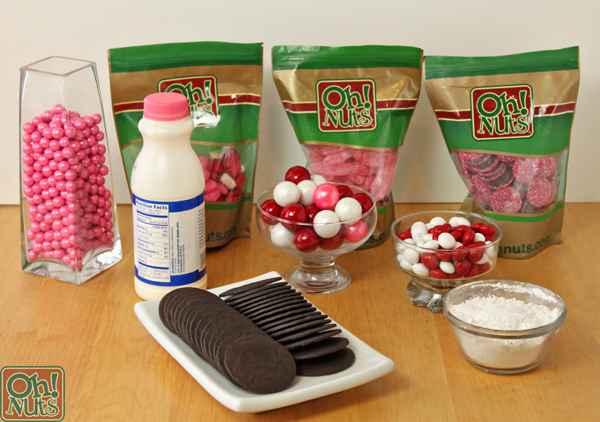 Don’t worry about being too precise, since you can use the candy to cover up any big mistakes. After all of the cakes are assembled, refrigerate the cakes for at least 3 hours, to give the cookies time to soften. The cakes can be made several days in advance and kept, refrigerated, until you’re ready to decorate them. Now for the fun part! 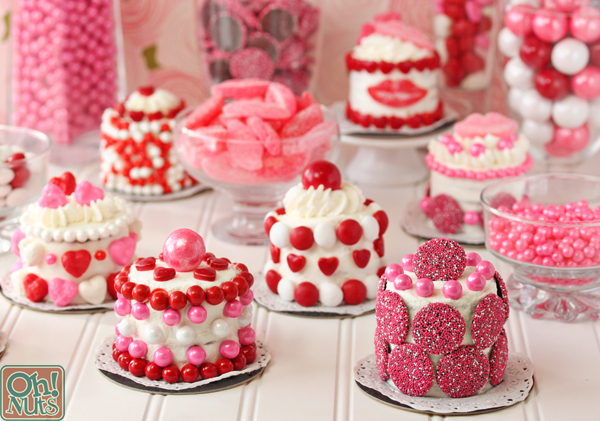 Decorate the cakes with an assortment of Valentine’s Day candy, and additional whipped cream, if desired. Depending on the candy you choose, the coloring might start to seep into the whipped cream as it sits, so for the best appearance, decorate these shortly before you plan on serving them.